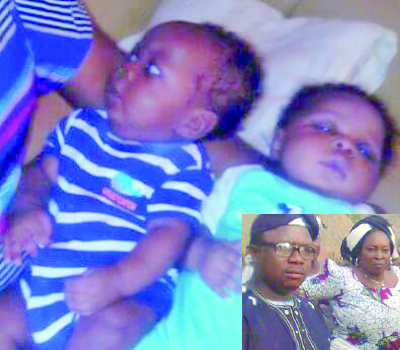 After 17 years of search, a Nasarawa born bouple, Mercy and Shedrack Audu finally got answers to their prayers on the 7th of November 2016 when God blessed them with a set of twins ( a boy and girl) christened Joseph and Philomena. Expectedly, their birth instantly wiped off their tears and pain they suffered for almost two decades, as they savoured the glory of God wherever they went. Basking in the euphoria of the arrival of their precious babies, Shedrack, a lecturer at Nasarawa State Polytechnic and his wife went to Makurdi, Benue State, on the invitation of his bosom friend, Fidelis Mbaka, to show him their bundles of joy. On the scheduled date, Monday, April 17, 2017, the couple set out with the babies at about 10.30am aboard a commuter vehicle, which took off from the Lafia motor park en-route Makurdi. Then, the unexpected happened a few kilometres to their destination. A 911 vehicle loaded with yam coming from the opposite direction rammed into their vehicle while manouvring off a crater, killing seven persons on the spot including the 5-month old twin babies. Among the dead were the driver and four other passengers aboard the Toyota car in which Shedrack was travelling with his family. However, the couple were the only survivors, rescued and rushed to the General Hospital, Daudu, where they were revived and placed on intensive care for one week, before being transferred to the Dalhatu Specialist Hospital, Lafia, Nasarawa State capital. They were recently certified fit and discharged. “My brother, life is worthless and meaningless to me now; I have surrendered my life to God. I am 50 years old while my wife is 42; we have allowed God to do His wish”, says Shedrack, as he told our correspondent the story of his battle with childlessness before a breakthrough, but the joy was short-lived. “My twins were born on November 7, 2016, and they died on April 17, 2017. I met my wife who is of Eggon extraction from Akwanga Local Government Area of Nasarawa State, in 1998 at the University of Jos where I was studying for my Master’s degree in Business Management; she was a student in the Theatre Arts department. We dated for a year and got married. Three years after our marriage, there was no pregnancy and we became worried; we visited Dalhatu Specialist Hospital for medical checkup and after a detailed examination, it was discovered that she did an abortion in 1997 through a quack doctor, which affected her womb. “From that time till 2016, we were in and out of the hospital trying to see how she could conceive to no avail. We were initially afraid that once she reached menopause, it would be a big problem; she suggested we go for in-vitro fertilization (IVF-test tube) where the eggs and sperm are fertilized outside the womb into test tube, but I disagreed. We remained faithful to God until February 2016, when she conceived naturally and delivered through caesarian operation. We were extremely happy, but God has taken them away”, he lamented. Shedrack, who hails from Lafia Local Government Area of Nasarawa State, also gave graphic details of the fatal crash, which claimed his babies. “As we were approaching Daudu in Guma Local Government Area of Benue State, a fully loaded 911 truck was dodging a pothole at the time our car was also negotiating to dodge it; the truck rammed into our car. My wife was carrying our female baby, Philomina, while I lapped the male, Joseph; they died instantly as they were badly hit by fragments of the crushed car; the driver and four other passengers also died on the spot, while my wife and I sustained injuries. am really speechless and confused here, were those children not meant to come to the world at all? however, I pray d almighty God gives them the fortitude to bear the lose. May God forgive your foolishness, have mercy on you and give you a second chance. God did not take them away, you didn’t have a discerning spirit. Those poor babies were targeted in the accident, the other dead people were just unlucky. How on earth can your friend who’s supposed to visit newborns ask them to visit him instead? Where lies your wisdom and analytical power? Is that your friend Benue Governor or Nigeria President? After waiting for 17 years for a gift, you got it and gambled it away on the orders of a friend and in order to please him. Aye Le o. Omo araye efura. Ifura logun agba. That’s why in everything I do, am positively selfish o. I please myself first before pleasing others, God has given me that strong heart not to care what others think, but to please God and myself first. Poor couple! They may have used Afoshe to command them. Come back and comfort your parents by this time next year. They’ve learnt their lesson. Very sorry for this sad news. May the souls of these twin babies rest in peace. Devil is a liar. It is very painful but please still continue praying. God almighty will bless you with triplets in Jesus name. CHAI…. A sweet testimony turned Saddest news of the week. What a painful experience! The kids are already with the creator. May God comfort the man. May God have mercy on you and console you. It is well with your souls. Don’t lose hope and don’t give up. Keep the faith. Job in the Bible had a worse predicament but the Almighty Jehovah saw him through. For with God all things are possible. God knows more than u do, He will give u another one, that is y u and ur wife are alive. give God the glory for only Him alone can do wat no man can do. Very very sad news, the two little angels are already in the right hand side of the God almighty. RIP to the rest of the dead. So sad, am just speechless. I’m so sorry please take heart, God knows best. Whatever will be will be, don’t lose hope, God will bless you with triplets soon.